Attempting to build my first HT in my new home. The room is above the garage and the dimensions are 26' x 13'. Below is a pic (sorry its not a great one but the only one i had on my phone). I recently made a few upgrades and I'm not sure my Denon AVRS730H is a good option anymore. My question is do I have enough power to drive the system with that Denon or should i think about upgrading. The RP fronts are being delivered, so i haven't hooked them up yet and i didn't want to damage anything if they were not suitable. Another question. I don't have any rear surrounds currently because i thought the in-ceiling (atmos) speakers would suffice but i guess that was poor planning by me. Should i get rear speakers and a separate amp to drive my fronts and keep the Denon (bc its only a 7.2). Or should i just scrap that idea, bite the bullet and get a 9.2 if i want to add rears? Thanks for any input or if you have any other advice to improve my systems.....I'm all ears! 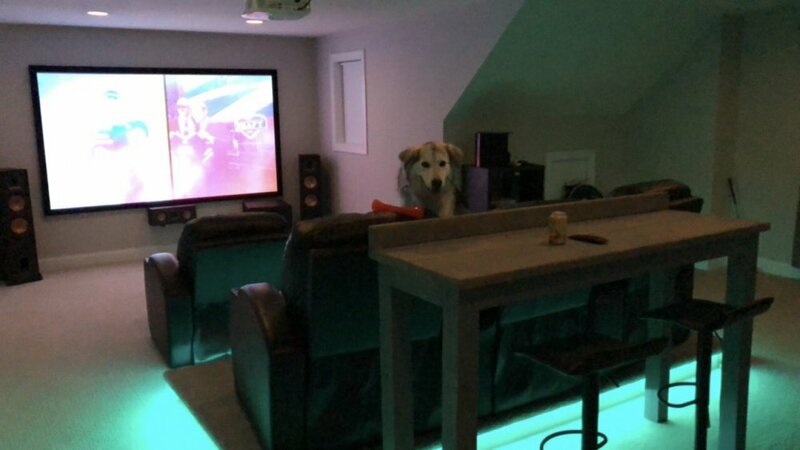 Yeah, those speakers are begging for a Receiver way up the food chain. A room that size, you would likely benefit from an outboard amplifier down the road. I have a higher model than you--DENON S920W and currently running a 5.2.2 setup. I would recommend getting a receiver with more channels with more power. Bigger is always better to have so you do not lose out wanting more. The higher models allow additional channels with the use of an external amp which can be seen in the X-series of Denon's AVR units. Seeing how your HT configuration is, you may like to run 5.2.4 setup seeing you do have the space (long length) to run it. More channels is always better in my book. I have a lot to learn but getting feedback from people that have experience is huge, so thank you. 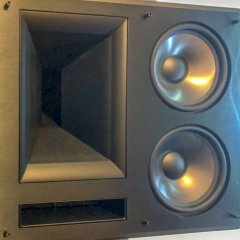 Forgive my ignorance, but will that Pioneer or Denon (that you suggested) have enough power for the Klipsch towers and the other speakers on its own? Or do i need to get the amp for those to play best to their capabilities? This is the never ending argument, on just about all audio forums. YOU will have to be the judge on whether you need an external amplifier, after you have upgraded the receiver. Both the receivers I linked are very powerful (many other options, those were just the ones I would be considering, if I were in the market) and offer tons of features and performance, especially considering the refurbished pricing. Do a little research on the different receiver options, in your budget, and pick the one that offers the most features you are looking for. They will likely be in the same power range so I wouldn’t put too much weight behind the watts/channel ratings. Receivers in this price range will have quality on-board amps. I am in the camp that it is better to have an external amp when driving 5+ speakers with a receiver as the watts/channel starts dropping quite a bit with multiple channels are being used. 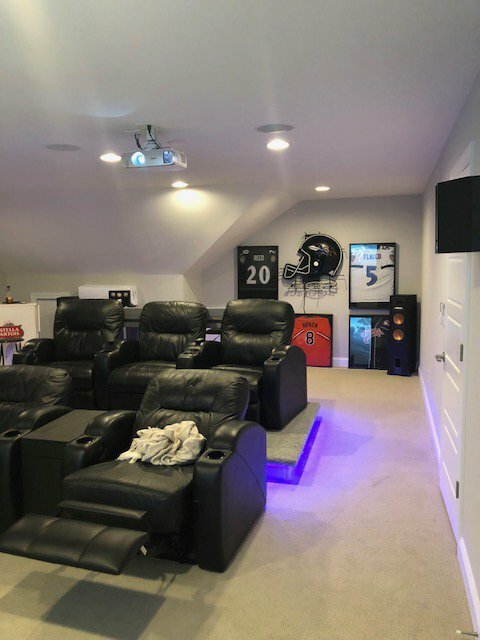 With that said, many people haven’t heard a difference, in their room and with their listening habits, when they went from using a top-shelf receiver to adding a multi channel amplifier. Others swear there was a “night and day difference” when they stopped using a receiver’s internal amps to a beefy external amp. This is where the problem arises, as everyone has different sized rooms and listening habits. You will need to make this big decision on your own, but the testing process is what I love the most about this hobby! HI, i have the Denon AVR-X4300H and i love it. 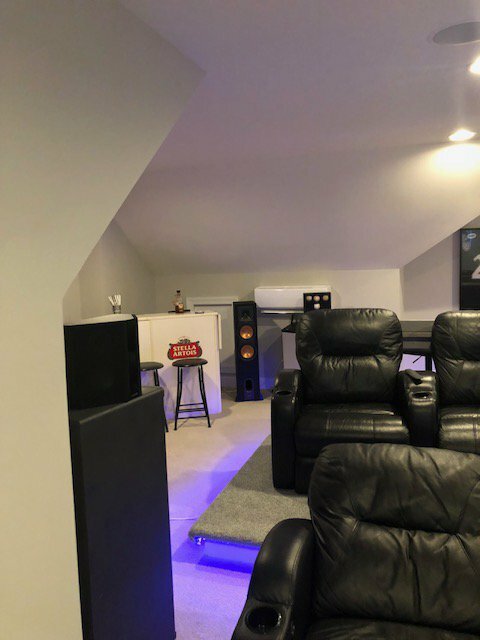 i do have 2 Emotiva power amps XPA-5 and UPA-5 to power front center rear and side speaker and i use the Denon to power the atmos in ceiling speakers. you can pick up the Emotivas pretty cheap now on craigslist, they come up once in a while from someone downsizing. That makes sense. I'm probably going to pull the trigger on the Pioneer or the Denon X4400H (i assume its the newer version of the X4300H) they have it on Amazon for $899 right now. I've heard a lot of good things about Pioneer even though I've only owned Denon and Onkyo. It looks as though the Pioneer that you linked doesn't have Dolby vision? Is that something that i should care about? I have a feeling i know the answer but i have to ask anyway......My current AVR has all of the connectivity that i need but lacks the power. Would it makes sense at all to keep my current setup and buy an external amp? I assuming if it was as simple as that everyone would just buy cheap AVRs and have external amps. depends if you have outputs for power amps. most cheap amps don't unfortunately. honestly if you get either the 4300 or the 4400 your set up and can add the power amps at a later date. 799 or 899 is a steal. I just pulled the manual of your receiver and I am afraid Bostonmurf is correct. Your receiver doesn’t have pre-outs with is a prerequisite for adding an external amp. The good news is that just about every AVR, in the $1k range has pre-outs. And yes, both the receivers I linked have pre-outs. Ok well that makes things a lot easier, haha. K5SS I know its probably more of a personal preference but would there be a reason you would choose Pioneer over Denon? I actually prefer the amps in the Pioneer over the Denon but I like Denon’s room correction better. For full disclosure, I am using Denon now and I am not sure what version of Pioneer Elite receivers are using for room correction, so hopefully someone will chime in with some real works experience. To make things even more confusing for you, I am probably going to give Anthem or NAD a shot, the next time I feel my receiver is falling behind the technological curve. Looks like im going to go for the Denon x4400h. I did also considered the Marantz sr 6012, but i think i really just wanted the name.....seems like the Denon checks more boxes for me...if anyone feels like im wrong from personal experience please chime in. If you get either Denon or Marantz (both of which have Audyssey) read this stem to stern before running Audyssey. It might take an hour, but is a masterpiece by Keith Barnes, with several consultants. "Audyssey FAQ Linked Here"
So now I need advice on my rear speakers! Right now im running my r28f's as my rear channels. I am going to most likely sell those. I'm considering the rb-51, rb-41, and the rp150s. Should I mount these mid way up the wall or at the top of the ceiling an point them down? I have 2 Atmos Speakers, should i hang the rear one high so I can run Auro 3d? I still have limited knowledge on this but I'm not sure my best option. No matter what AVR you are going to choose I'd strongly recommend to add a separate power amp to front channels at least, it improves sound a lot. Emotivas mentioned above are a really nice choice. Would it makes sense at all to keep my current setup and buy an external amp? I would buy and SPL meter or use an app to see how loud you listen to your favorite material. If it starts to distort at the level you want to listen then an external amp would be beneficial. If not, save your money and spend it on something else. Fwiw, I run the system below close to Reference levels in movies and 80+ dB on multichannel music and don't need an external amp. It depends on how loudly you play, the amount of dynamic range in your music/movies, and how good the power supply in the AVR is. Many, perhaps most, AVRs have misleading power specs. The one that is real is power in watts with all channels operating (therefore properly stressing the power supply), 20 to 20K Hz, 8 Ohms, at low distortion (0.09% or less). Most manufacturers do not advertise power with all channels operating, just with 2, or worse, 1. You have to get this info from a review that includes bench tests, or have your friendly local dealer run one for you in a brick, mortar, and measuring instrument store. Although most AVRs have some dynamic headroom, to be safe someone with speakers of 94 dB anechoic chamber sensitivity (98 dB room, 2.83v, 1 meter) should probably have an amplifier of at least 100 watts per channel, as measured with all channels operating, 20 to 20K Hz, 8 Ohms, and less than 0.09% THD. It is true that when all speakers (except the subwoofer) are set for SMALL, and the crossover is set for about 80 Hz, the subwoofer will do a lot of the heavy lifting, and take much of the burden off of the AVR and the main speakers, but not all! A great timpani, bass drum, or Tam-Tam hit, as in Fanfare for the Common Man, can have an attack frequency of anywhere between 80 and 150 Hz, depending (and resonance much lower). 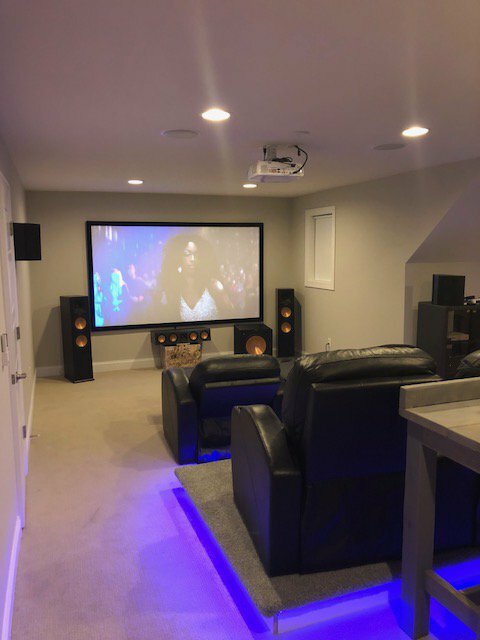 In movies, several sound effects, although they send most of their energy through the LFE to the subwoofer, with an additional 10 dB of available headroom (up to 115 dB) can still have great intensity above 80. You don't want the leading edge to clip and take out a tweeter!